"Thanks for reading about me! 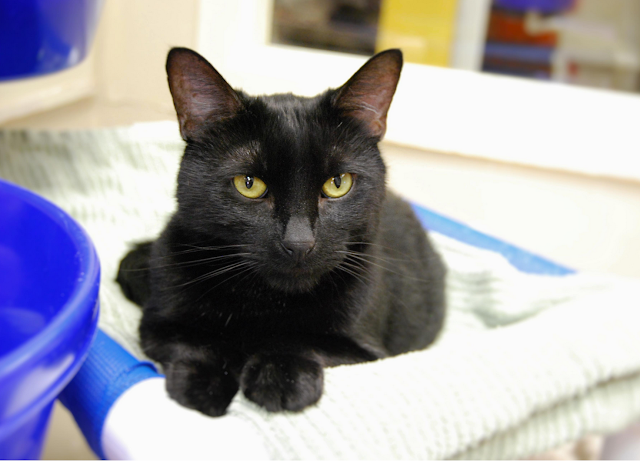 My name is Scotty, and I’m a black kitty with a very sleek and silky coat. I've been told I have amazing golden eyes, too. What do you think? I’m a playful, affectionate and loving boy who enjoys sitting beside you or even on your lap. I've lived with other cats and got along with them okay, but I really adore human attention, so if it's all the same to you, I might really enjoy being an only cat. And I have to admit, I think I'd also rather be in a home with no young children. You see, I can be a little shy at first, and those mini humans can be a bit intimidating! For that special someone, though - I promise, I warm up quickly. I have a lot of love to give and can hardly wait to find my purrfect match to give it all to!" "Also, I'm front-declawed which means I need to be an indoors-only kind of guy since one of my main forms of protection has now been removed. But hey, I'm totally down with protecting the inside of your home. I have mad skillz in that area! Want to come by and see if we're meant to be? Just ask for short, dark and handsome. They'll know it's me - Scotty!" Scotty's available at Allie's Alma Mater, Wayside Waifs. Scotty is a fine looking ManCat....we hope he gets a great forever home soon!! Hi Scotty. I completely agree about living in a home without little humans. I hope you find your perfect home soon. What a sweetheart you are, Scotty! We feel the same way about little humans ourselves! Scotty, I hope you find a home soon! You are evfur so handsome and dapper! Hope you get the best new home evfur, and quickly at that!